(Newser) – Kansas Secretary of State Kris Kobach says he will recuse himself from the vote tally in the state's tight gubernatorial primary race, which he leads, but barely. Kobach's current job makes him the state's chief elections official, and his opponent—incumbent Republican Gov. Jeff Colyer—has called for the recusal, reports CNN. Kobach will now oblige, "but as I say, it really doesn’t make any difference. My office doesn't count the votes. The counties do." 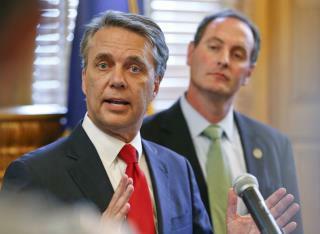 Colyer also has demanded that Kobach refrain from advising election officials as they recheck tallies, with some finding discrepancies between their totals and what the secretary of state's website reported, reports the Kansas City Star. Kobach has chalked up the discrepancies to "keystroke errors." Cry baby cry nobody wants these maggots in any office around the country, if there was a problem with Kobach running it should have been disclosed at the start. The Dirty Demonic Rats are as trust worthy as a pick pocket. Well how 'bout that? Will wonders never cease?